I made this image in Sterlingware with only a slight hue shift in XnView, my trusty side-kick. Although Sterlingware is now over 10 years old, which is pretty old by software standards, and lacks many of the new features that extend the rendering powers of fractal programs (i.e. user formulas and other junk) I consider it to be the current Heavyweight Champion of Fractal Art without any real competition. No, no. Not at all. It’s because of Sterlingware’s color capabilities and the ease with which it allows you to experiment with it. A color coup d’ etat. While new formulas and all that other confusing stuff may sound exciting to the mathophiles in the fractal art world, and has probably lead to the current stagnation of fractal art, it’s what you do with the structures created by formulas that leads to the creation of Fractal Art and not just fractals. 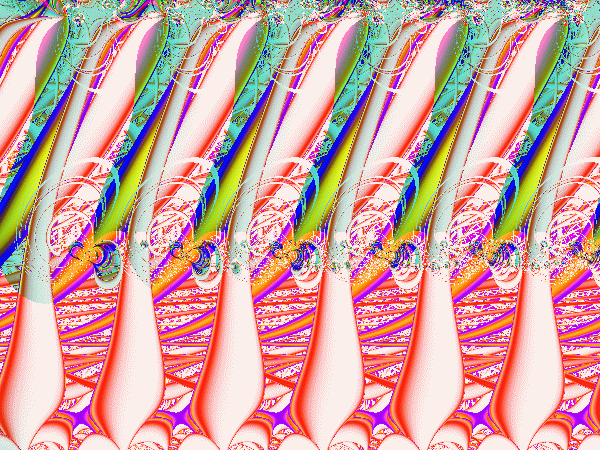 I think the first converts to post-processing were those who saw something interesting in the basic fractal images they were making and knew how to make that short, but quantum leap to completion in a graphics program. I’m sure the earliest post-processing successes involved simply color enhancement and not the thermo-nuclear layering that we see proliferating today. Color is a big deal in art because it’s a big deal to the human eye, that is, to visual perception. Color turns straw into gold. Which brings us back to Sterlingware. Sterlingware still has me engrossed in fractal art despite the fact that it lacks power windows; GPS; and a talking dashboard like Ultra Fractal 5 has. Sterlingware is the Fist of Color! A lean, mean, Fractal Art machine. Ha! Ha! Ha! …I win again! Sorry about that. But when I say excited, I really mean it. If you don’t like it, then go parse yourself.